I love linking up with other bloggers. Today, I was blog hopping and found this great blog with some fun freebies. 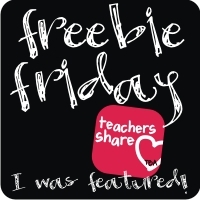 There are some great freebies so stop on by Teacher Blog Addict to check it out. This site also does a great job with video tutorials. I put a facebook link on my site with her steps. I just have to fine tune it. Here is my Friday Freebie: Pet Rocks, Rock!